Image's Noble Causes, a self-professed "super-hero soap opera," is the ongoing saga of the Noble family, a wealthy tribe of super powered kin. Where its peers seem to focus more on the dynamic of good vs. evil and the physical battles that ensue, Causes takes a more active interest in the clan's personal lives. Recently, the book has thrown the status quo to the wind and leapt five years into its own future... mixing up the cast and changing the landscape considerably. Writer Jay Faerber has been with the series since its inception, and his familiarity with its characters is clear. Although this issue features a lot of different faces, they're all treated to their own unique identity and as a new reader I never felt lost or overwhelmed. There's a lot of internal conflict amongst this team, and some heavy accusations are tossed around within the first few pages, but Faerber does a fine job of keeping everyone up to speed, regardless of their familiarity with the story so far. That's a lot easier said than done without the benefit of an introductory "previously in..." blurb. 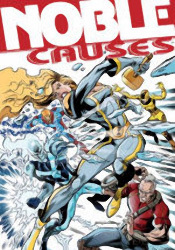 The concept of a dysfunctional superhero family isn't entirely unique, although the writer does enough to distance Noble Causes' approach from the competition. Occasionally, he allows the soap opera aspects of the series to get the better of him, (there's more than one overdramatic attention whore-style outburst in this issue) but he generally balances that out with honest conversation and a touch of action. My biggest gripe is that although the Nobles deal with plenty of adversity in this issue, it's all sorted out so quickly and easily that nothing seems to be of any real circumstance. The heroes bicker fiercely amongst themselves, but ultimately take the moral high road and talk through their differences, diffusing the situation while also draining it of its drama. Their battles with villains are so humdrum and easy that I wonder why the bad guys even bother putting up a fight. How long would the dynamic between Spider-Man and J. Jonah Jameson have lasted if they'd casually shook hands and agreed to disagree after the Daily Bugle's first negative story about the web slinger went to press? There's a lot of potential to tell some really emotional stories here, but because the conflicts are solved so cleanly, they never get the chance to develop into something of substance. When Faerber finally drops a pair of bombshells at the end of the issue, I'm already resigned to the fact that they'll be wrapped up before issue 35 is laid to rest. Turkish-based artist Yildiray Çinar gives the series a very clean, open visual identity. While his artwork is extremely simple and underdetailed, that doesn't mean his characters are unrealistic or exaggerated. Where Bruce Timm and Michael Avon Oeming use a similarly light-handed approach with their linework, Çinar's characters have little else in common with theirs. They retain a very lifelike, realistic shape and size, without complicating the page with excessive detail. While he takes that concept to an extreme by routinely leaving out the accompanying background artwork, his grasp of fluid motion and ability to lead the reader's eye from panel to panel make up for it. While the book takes pride in its focus on character interactions over explosive fight scenes, this issue was peppered with enough action to keep Çinar busy throughout. I had a hard time making heads or tails of this book. I liked the atypical direction it takes with a very common subject, humanizing its superheroes by spotlighting their rocky relationship as a family, but never felt a sense of urgency or importance to any of their actions. I loved the brunt of Yildiray Çinar's artistic contributions, but found his lack of backgrounds and occasional losses of focus to be distracting blemishes on his style. It's got its ups and its downs, I suppose. Flip through it... it's not quite good enough to go out of your way for, but not nearly bad enough to discredit.